We’d love your help. 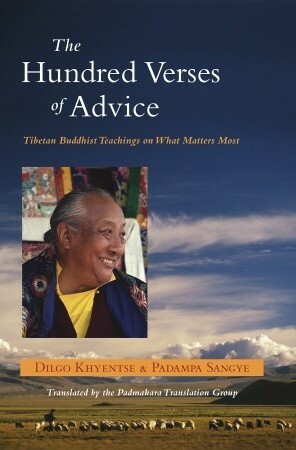 Let us know what’s wrong with this preview of The Hundred Verses of Advice by Dilgo Khyentse. To ask other readers questions about The Hundred Verses of Advice, please sign up. A brilliant thinker of our time and a teacher to His Holiness the 14th Dalai Lama, this is possibly the most solid reading on Buddhism I've come across, concise and shakes your core. Lifes most important lessons are crammed in here and eloquently written. I have re-read many of the chapters, some are even worth memorizing. Khyentse gives us a simple message, tells it poetically in many different ways to sell/teach Dharma. The opening chapters focus on death, and how it's an absolute certainty. T A brilliant thinker of our time and a teacher to His Holiness the 14th Dalai Lama, this is possibly the most solid reading on Buddhism I've come across, concise and shakes your core. Lifes most important lessons are crammed in here and eloquently written. I have re-read many of the chapters, some are even worth memorizing. Khyentse gives us a simple message, tells it poetically in many different ways to sell/teach Dharma. The opening chapters focus on death, and how it's an absolute certainty. To live well is die well, the proceeding chapters discuss samsara and nirvana (or living well) The examples are beautifully laid out and illustrate the harmful effects of a mind riddled with samsara or even nirvana, the co-existence of these two forces, and lack of reality if one didn't exist without the other. Khyentse Rinpoche's Buddhist teachings offer closure/understanding on the past, and focus on the present and future. I found this book while browsing through my public library in Tulsa, OK. I would recommend this book to people who like to journal, people who like yoga, people interested in Zen, peace-building, and empathy. I used this book as a firestarter to journal my thoughts about each verse and so I worked through some things while reading this book. Highlights would be the verses that helped me think of my thoughts as clouds passing through the sky of my consciousness & the verses about self-compassi I found this book while browsing through my public library in Tulsa, OK. This is a book which I read over and over again. It's easy to pick it up and read an entry as a daily practise. Each time I read it, I learn something new, about myself, and about living consciously. Highly recommend this book to both buddhists and non-buddhists. Wisdom, Wisdom and direct advice.